I've been having a little think about our homesteads, partly from seeing shots etc from the Halloween Ghost Town. Something sprung into my head that would do two things that I'd quite like. Open up a chunk of homestead and allow me some more design flair. It's no secret I love to design my homestead, in fact I've always been a fan of urban planning type games. Sim City, Zeus, Emperor etc, etc. City builder games. By now my homestead design is becoming more limited with the amount of new buildings etc we're getting. It means everything is becoming very utilitarian, all business, no pleasure. And SO... here's my Andy's Imagination Idea for October. We've seen the precedent, the greenhouse and the Trail both take us to separate maps that allow us to do different things, so why not have a second area for "Town" leaving our original areas as the Homestead. The thinking is simple. The Homestead would be our "Farm" (I know, I know, folks hate the Farmville reference but that's what it is.) It'll have crops, farm buildings such as the barn, rodeo etc. It would be where we grow crops, tend our animals, it'll be where we and our families LIVE. So Homestead to work and live, Town to use buildings and shop. The town wouldn't need to be very big, in fact it would only have to be, at most, the size of our very first homestead, only about 65% or so of a fully expanded homestead at the moment. It would clear all the room off the Homestead that "Town" buildings take up, and let us explore our design flair. As well as being able to design our Homestead we could have a lot of fun designing "Town". It would be a much more logical place for statues, flowers, all those random decorations we've picked up. We could design a main street, a school district with a playground, a church area with a proper design... Personally the increasingly tight surroundings of the homestead make me less interested in playing, tell me I have a 20-25-a-side Town area to design and I'd be as happy as Larry on nitrous oxide. The other great thing it would bring is realism. Back in the Pioneer days you'd often not get a big town attached to a farm, they'd be split, at least partly. We're pioneers after all, not town planners, so why not let us have our pioneer homestead, all farming and self sufficiency AND a town to go to for fun etc. In one fell swoop it would (well, for me at least) make the game better and stop folks worrying so much about homestead space, simply by moving stuff to a Town it would open a heck of a lot of that up. I think that's a great idea! You need to let the developers know about this - it makes so much sense. Using this concept, why not more than one town? I can decide to go to Dodge City or Morgantown or whatever and each can be a totally different place (like one is full of bars and gunslingers and the other full of church going folks) just like real life. Heehee! I think its a great idea, I would also like to see them take the animation off the animals. I hate waiting 4 minutes or more to load some of my neighbors homesteads. I have a brand new GAMING system and it can't handle the animation of 3,000 animals on one homestead. (Seriously, my old bored a** sat and counted one farm, 3, 217 animals on her homestead) Sighhhhhhhhhhhhh!!! I have incorporated both in my one homestead and it is not too shabby. But you are absolutely correct, I do not have enough room to put the "chairs, water pitchers, bbq roasts, buckets and all the other little gadgets that make the homestead a REAL HO-DOWN farm. I have always had a school YARD - and I even made the church from painting white a school bldg, BEFORE they came along with the church. SO MANY of my FRIENDS comment "Look, she actually designs it as IF SHE LIVES THERE". THey tease me, but it is true. Getting crowded is not the word. Love this idea!!!! Things are way too crowded now. No place to put any of the new buildings. Great Idea! but at this point i'd be happy with more room! great idea!! I soooo agree!!! Cool idea, but why not just "buy" more land!!! Most people i know have millions of coins, and you really dont use that much. Now you deposit them, but what does that really do for us. We could use the coins and buy more land. Just another thought! Brilliant. Why couldn't this happen? Can't you pass this on to Zinga? Lately I do things like the Capital One band stand and then delete it immediately. Silliness. It's getting too crowded, to repetitive, too one dimensional. I also get tired of the random objects they give us that should be indoors, like a table with settings or a hope chest or stove, that you just have to sit in the fields. What the heck? It would be cool to have an inside farmhouse too though I know that won't happen, like Simm's I guess. You should pass your idea on to Zinga....PLEASE! It would be wonderful to have a separate town. Never made much sense to me to have to crowd the town around your homestead. Hope they pick up on this one soon! Awesome idea love it that would be so much better. Zynga should take this idea and run with it. I hope u gave them this wonderful suggestion. This sounds like a great idea. I love playing and advancing in the game,but I also love to decorate and make my land look good!!! I thought this so long ago. I totally agree. Originally, that is why I left farmville and came here because I thought it would be closer to what you are describing.. I try to leave my homestead seperate from town, but have found it limiting recently. Good idea! Hey Zynga! Listen to the man! Most of my decorations went into storage & then were sold. What's the point of having these things if you can't use and enjoy them? 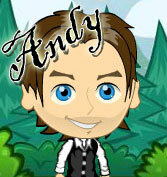 Same is true in the real world.lol Great ideas, Andy..perfectly logical. Give us breathing room. I think this would be the best idea of the month! I appreciate all the recent options to plant, feed more animals with the barn, fowl pond, green house, animal hospital, etc. But you are so right that there is little to no room to do what we want to do with our homesteads!! While I am on the subject why are we still calling it our 'homestead'?? It is so crowded with 'town' things, right Andy?? Sounds like a wonderful idea to me.Maybe Zynga will grab it and go. I think this is a fantastic idea... however, would like a little more space to plan the town, there are so many decorations. there are many toys and items for just the play ground alone. maybe a space for camping too... so we can put out all those tents. and finally keep some trees!! yes.. this would be terrific!! Changing the storage shed to allow you to still obtain daily bonuses from buildings stored there. Making all animals storable, especially moose. Making trees, and even buildings, be able to be see through so you can see what's going on around them. It's all about making the homestead a more homely place - at the moment mine just looks like a dumping ground!! I really like this idea. AWESOME!!!! Well said, Andy! This is something I've wanted ever since we got the first town building. Andy, you have the start of a good idea there. I have so much in storage and can not enjoy it, no room for it. 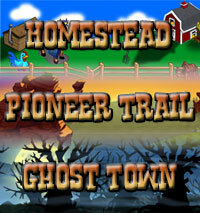 What I do not like about PT, is they have lost the idea of the "old west" and became a fantasy land like Farmville did. How many pioneers had pink and blue sheep, and foreign animals. There are so many things now, that do not belong in the old west, it's shameful. The missions take so long to do that we have them backed up and try to complete.. it is very hard to do. Some folks spend all day in the game. Most of us do not have that much time. So many items cost horseshoes, we can't afford that either. When Frontierville started, things were more like olden times, now Pioneer Trail is getting too greedy for my liking, and no time to finish all missions and just enjoy the game, visit neighbors to HELP them instead of take from them for missions. Maybe a train ride could take us to a big city for excitement, or ride a stage coach, which would be more realistic. A cattle drive, an auction where we can sell excess animals for coins letting our neighbors buy them from us ? I would really like to see all of our inventory items to be giftable we we can help new players. Most all my newer neighobrs give up the game because they can not keep up and we can not help them with the things they really need. Slow down the missions so we can actually enjoy playing again. Keep up the good work Andy, we appreciate your help. I too like making my homestead beautiful rather then untarian. I've kind of done the same thing within the parameters of the current game. I have a town with a town square and I have the farm. I also have the "woods" with woodland animals, trees, flowers, "debris". You are right on track! Wish they would do exactly what you suggest. I LOVE this idea. The reason I quit FV was the excitement of the frontier life. This plan is realistic and fun! Hope the developers are listening! WTG Andy! can you please take over the game Andy, because all your ideas are what the players want... never mind what Zynga say.. Maybe you should set up your own game as you know exactly what would make it fun and keep us all interested!